Astrodon 6 nm H-a, OIII and SII narrowband filters using the HST pallete (R=SII; G=H-a;B=OIII). The large arc, IC2177, �resembles the wings of a bird, and the bright circular region (Gum 1 – vdB93, Sh2-292) resembles the head of a bird. Hence, this complex is named the Seagull Nebula. It is located about 7 degrees NE of Sirius in between the constellations of Monoceros and Canis Major, and is about 1800 light years distant. 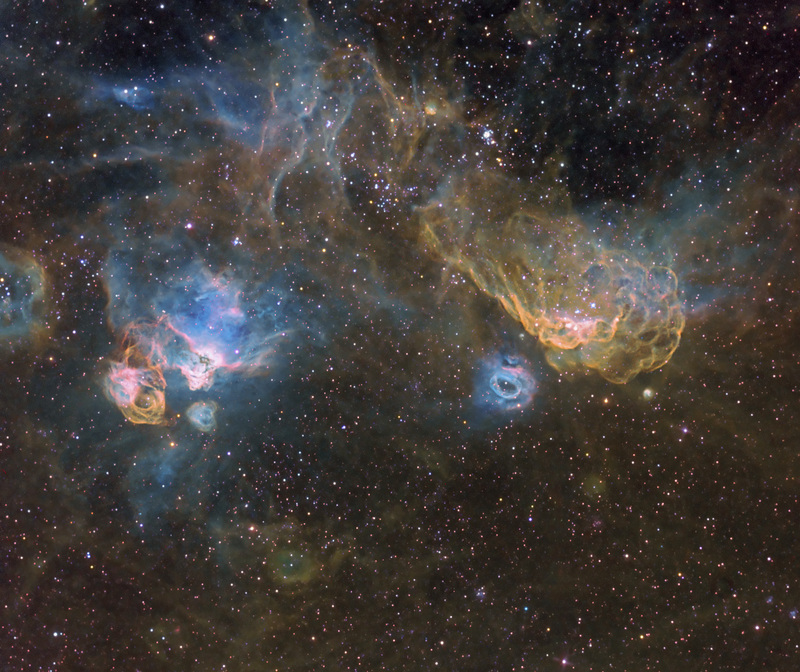 Cederblad 90 is the bright object at the tip of wing near the top of the image.� It has been suggested that the sweeping arc of the Seagull wing could be a supernova remnant. This field is ~4 x�4 deg.